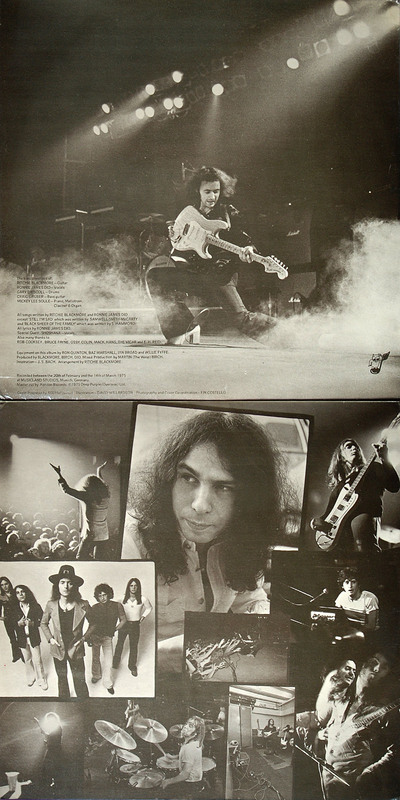 Having complained vociferously about the funk/blues style of the last Deep Purple album, ‘Stormbringer’, critics and fans alike expected a different approach from Blackmore; back to the heavy, guitar-led style of ‘In Rock’ or ‘Machine Head’ perhaps…so, imagine the surprise on hearing ‘Ritchie Blackmore’s Rainbow’ upon its release. The overall sound and production is quite laid back, some would say ‘muddy’, and quite similar to ‘Stormbringer’. Given that it was recorded at the very same Musicland Studios in Munich just over 6 months after ‘Stormbringer’, and with the same producer in Martin Birch, maybe it shouldn’t have caused as much surprise as it did. The opening track of ‘Man On The Silver Mountain’ sets the scene well, a moody, dark riff. Dio’s vocal is particularly strong with an interesting, mystical lyric. Keyboards are very far back in the mix to be almost inaudible. Overall a strong song that would serve the band very well at live performances for many years. ‘Self Portrait’ follows and again has a distinctive guitar riff, but this seems a little more restrained, with actually the bass guitar driving the song. Keyboards again seem to play little part on the track. A reasonable album track, but nothing to get too excited about. ‘Black Sheep Of The Family’ is the track that could be said to have caused the breakup of Deep Purple Mark 3…and one now wonders what all the fuss was about. It actually does sound like it could have belonged on ‘Stormbringer’, its uptempo, lighter sound is easily quite reminiscent of several tracks on the Deep Purple album with quite a funky bass line and guitar sound; such as ‘High Ball Shooter’ and ‘You Can’t Do It Right’. 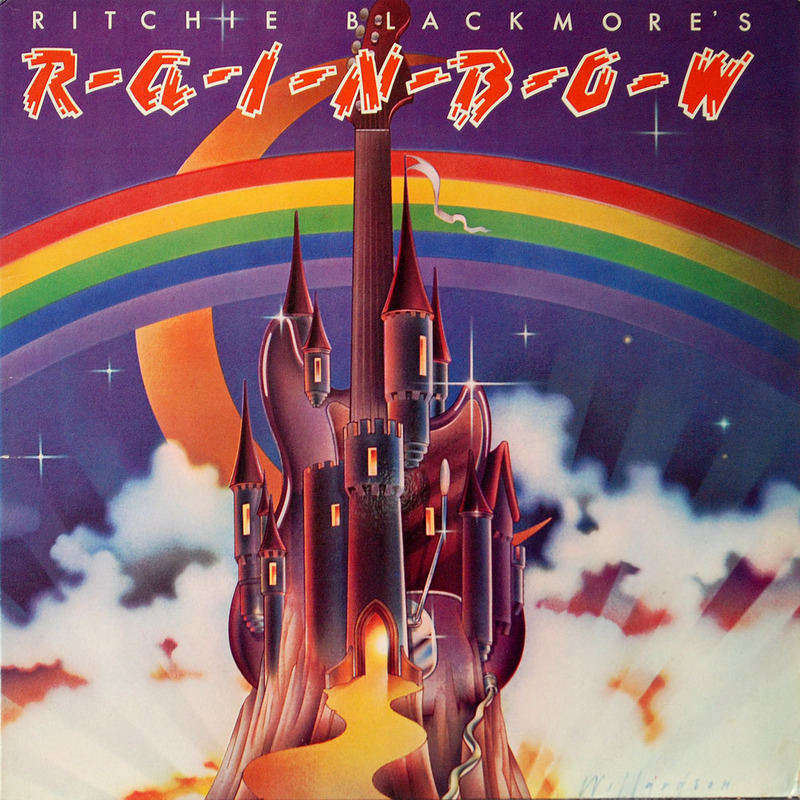 This would not be the only track on ‘Ritchie Blackmore’s Rainbow’ that would seem to be at odds with Blackmore’s desire to pursue a new direction away from Deep Purple’s funk/blues style. ‘Catch The Rainbow’ is an instant classic, destined for lengthy, anthemic live workouts. Restrained and tasteful slide guitar playing from Blackmore, with the intro section and main chord structure inspired by Jimi Hendrix’s ‘Little Wing’. Sublime vocal and lyrics from Dio. One of the standout tracks on the album. Side 2 begins with another song that could have come straight off ‘Stormbringer’ – funky, wah wah guitar from Blackmore accentuates ‘Snake Charmer’…another one to confuse fans and critics alike. A fairly average vocal melody and limp chorus relegates this to the status of ‘filler’. …until he finally got to play some boogie boogie piano on ‘If You Don’t Like Rock ‘n’ Roll’. This is another song that doesn’t really fit with Blackmore’s alleged new direction. Sounding vaguely similar to ‘What’s Goin’ On Here’ or ‘Lay Down Stay Down’ from ‘Burn’ it would have sat better on an Elf album than on this. ‘Sixteenth Century Greensleeves’ is a return to the opening promise of ‘Man On The Silver Mountain’ and unsurprisingly became another live classic. This is much more of what was expected, although it would be given an injection of pace and energy by the subsequent line-up change. The album closes with another slightly odd choice of track. Initial thoughts as the track begins is that Rainbow are covering Deep Purple’s ‘You Fool No One’, complete with identical drumming pattern and cowbell from Gary Driscoll….but this then turns into an instrumental rendition of the Yardbirds’ ‘Still I’m Sad’. This recording would earn Blackmore the wrath of Radio 1’s John Peel who was an enormous fan of the original. Nice guitar from Blackmore, but when you hear the full force of Dio’s vocals on the frenetic live version just two years later from ‘Rainbow On Stage’ you wonder why they didn’t record it with vocals in the first instance…? In summary, some interesting new ideas but too many references to earlier styles and tracks that Blackmore had supposedly had enough of in Deep Purple. Not the guitar ‘tour de force’ we had expected. 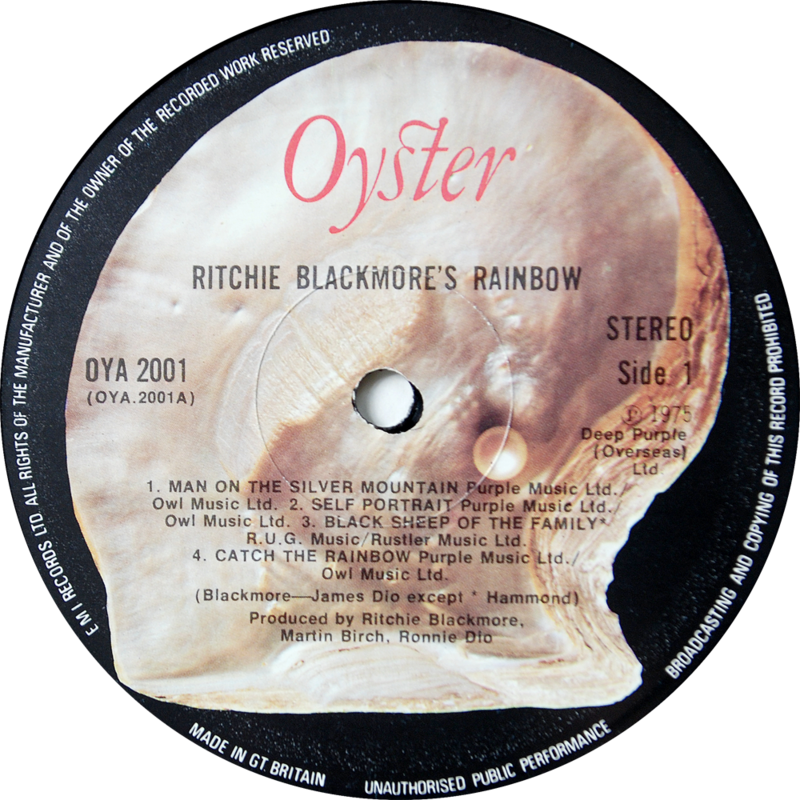 This was the only Rainbow album issued on the original Oyster label with this design. 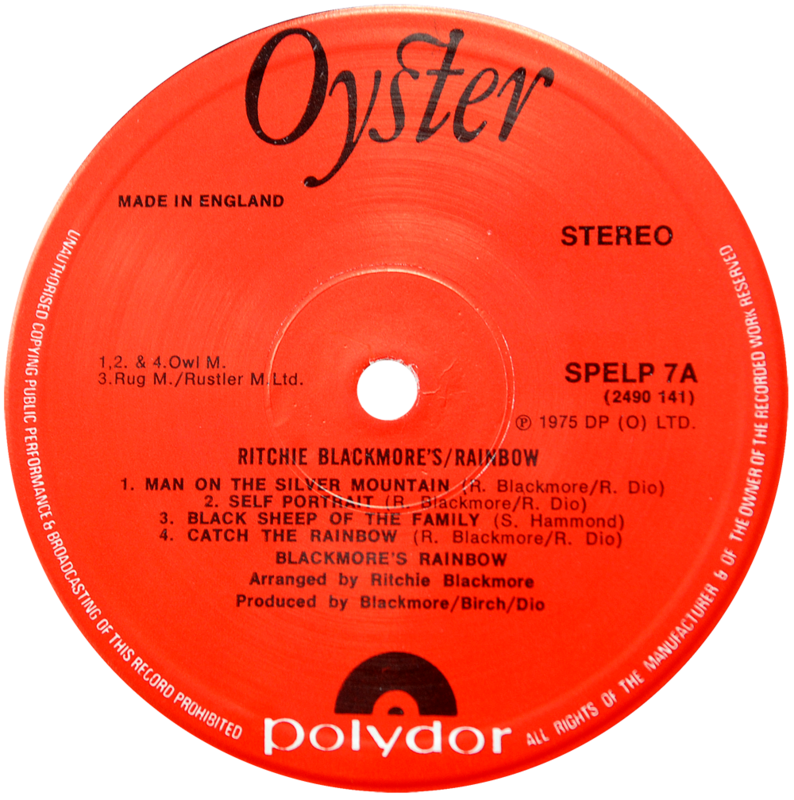 Blackmore refused to have his new solo project released on the Purple label, so the management team (with whom Blackmore was still contracted) created a new label and arranged distribution and production through EMI (Purple Records ‘parent’ company). Once Blackmore’s contract expired, Polydor acquired Oyster. Nice album, but not as good as ‘Stormbringer’.